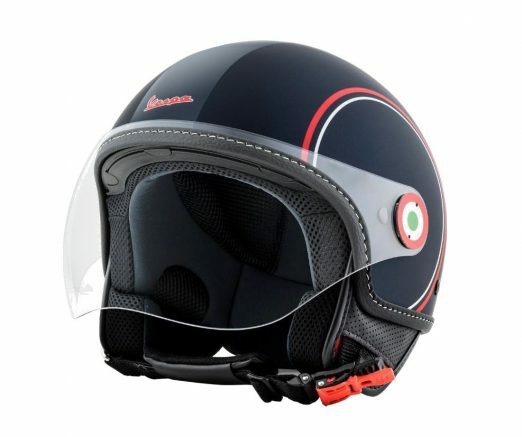 Get set for summer scootering with the Vespa Modernist Helmet and add a dash of Italian style to your ride. Part of Vespa’s 2018 Lifestyle Collection, the Modernist has a demi-jet design that offers all-round vision – ideal for navigating busy traffic – and is compact enough to fit in the under-seat storage compartments found on most scooters. The flip-up visor is held in place with tricolour-painted aluminium hinges and is long enough to offer protection from wind, rain and dust, making the Moderninst a practical proposition throughout the seasons. A seatbelt-style strap with a micrometric fastener ensures a snug and secure fit, with a quick-release buckle, so there’s no fiddling around when a destination is reached. To keep the wearer comfortable and cool when hustling through the urban jungle there’s a breathable, 3-D fabric lining, which is removable and washable, too, for season-long freshness. This entry was posted in Scooters, Vespa on 01/05/2018 by Dan Sager.